Shen Wei discusses his residency at Meadows. Shen Wei is an acclaimed choreographer, director, dancer, painter and designer whose many honors include the MacArthur "Genius" Award. As the artistic director of New York-based Shen Wei Dance Arts, he is widely recognized for his defining vision of an intercultural, interdisciplinary and original mode of movement-based performance. Shen Wei's works use visual and storytelling elements from the theater, Chinese opera, and traditional and contemporary art to create what one reviewer called "a fascinating fantasy in movement." For each work created with his company, Shen Wei also develops the sets, costumes and make-up designs. Shen Wei's residency in Dallas is taking place over winter-spring 2012. It includes a new work choreographed for SMU dance students, to be presented at their 2012 Spring Dance Concert March 28-April 1. Born in Hunan, China, in 1968, Shen Wei left home at the age of nine to study Chinese opera in almost total seclusion. Over the next eight years he mastered the xiao sheng (young male) role, along with the disciplines of traditional Chinese ink painting and calligraphy. He also studied Western visual art from Neo-Classicism to Surrealism and Abstract Expressionism, which gave rise to a sensibility that led to modern dance. In 1991 he became a founding member of the Guangdong Modern Dance Company, the first modern dance company in China. In 1995, when offered a fellowship to move to New York to study with the Nikolais/Louis Dance Lab, he gave up the comfort and stability of a state-subsidized life in the arts and, with $500 in his pocket, few friends, and three words of English (“yes”, “no” and “thank-you”), he set out to make a new life in the U.S. Following his debut at the American Dance Festival that same year, his work was seen in Taiwan (1996), at New York’s Asia Society (1997), at the Stockholm Dance House (1999), the Brighton Arts Festival (2000), the Edinburgh Festival (2000), and at the Millennium Moves Festival (Germany, 2000). In July 2000 he formed Shen Wei Dance Arts (SWDA) with performances of Near the Terrace at the American Dance Festival. In 2003 his company made its New York debut at the Lincoln Center Festival. For the past 10 years, Shen Wei Dance Arts has toured extensively on five continents. Shen Wei has created 11 new works for SWDA: Near the Terrace Part One (2000), Folding (2000), Behind Resonance (2001), Near the Terrace Part Two (2001), Rite of Spring (2003), Connect Transfer (2004), Second Visit to the Empress (2005), Map (2005), Re- Part I (2006), Re- Part II (2007), and Re- Part III (2009). The entire Re- Tryptich premiered at Alice Tully Hall in 2009, opening the Lincoln Center Festival. In 2008, Shen Wei was commissioned to choreograph part of the Opening Ceremonies of the Beijing Olympics. In July 2010, he premiered a piece for Les Ballets de Monaco, which incorporated film he created for the piece and utilized a fully electronic score. 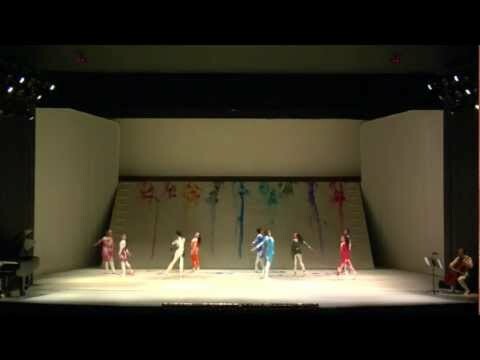 In September 2010, he created choreography for the Rome Opera’s production of Rossini’s Moise et Pharaon, which premiered in December 2010. In recognition of these achievements, Shen Wei has been honored with the MacArthur “Genius” Award and John Simon Guggenheim and United States Artist Prudential Fellowships. He has received six commissions from the American Dance Festival, two from Het Muziektheater Amsterdam, two from the Lincoln Center Festival, and two from the John F. Kennedy Center for the Performing Arts. SWDA has been honored with residencies at the John F. Kennedy Center, Syracuse University and Duke University. As a visual artist independent of Shen Wei Dance Arts, Shen Wei is a painter, designer and photographer. A series of paintings created in conjunction with his ballet, Rite of Spring, were first exhibited as part of the company’s New York debut at the Lincoln Center Festival in 2003. In October 2006, the paintings toured with the company at the Hong Kong New Vision Festival, and in July 2007 they returned to New York in tandem with the company’s performance there of Second Visit to the Empress as part of the Lincoln Center Festival. His book of photography, Tibet, was created to raise awareness of that region. Its proceeds support the Pandedajie School and Dickey Orphanage in Lhasa.